The North Phoenix Kiwanis Club on May 3 conducted its annual distribution of funds to area nonprofits, school-based groups, and other organizations that serve the Valley’s youth. The club is a subsidiary of Kiwanis International, whose mission is to “improve the world by making lasting differences in the lives of children” around the globe. 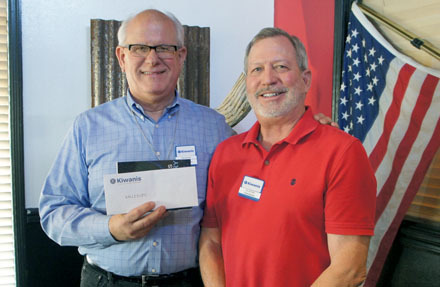 Jim Day, left, president of the North Phoenix Kiwanis Club, presents Cletus Thiebeau, president and CEO of VALLEYLIFE, with a donation check to support the nonprofit’s programs that serve those with developmental and/or physical disabilities (photo by Teri Carnicelli). The bulk of the local club’s funds are raised every year as part of its Walk-A-Thon, which invites teams to participate and splits the profits raised through sponsorships and donations with those teams. North Phoenix Kiwanis Club President Jim Day said last year the Walk-A-Thon had more than 32 groups participating, and grossed approximately $360,000—half of which went to the club’s nonprofit foundation. The Andy Hull Sunshine Foundation, whose mission is awareness, prevention and encouragement for those contemplating or impacted by suicide with a “You Matter” approach. First Mennonite Church, 1612 W. Northern Ave., and its summer programs that serve at-risk youth. Heart for the City, which provides sports, workforce development, after-school/summer programs and more for at-risk, inner-city youth in Phoenix. Kitchen on the Street, which started as a weekend food backpack program for low-income youth in schools, and has grown to include a café, food truck and catering services which provide on-the-job training for adults and income for the Bags of Hope program. MIKID, providing services to children with mental and/or behavioral issues and their families, including respite, support groups, direct care in the home, and more. Military Assistance Mission, founded to provide financial support and morale aid to current Arizona active duty military, their families, and wounded warriors—regardless of overseas deployment status. OCJ Kids, which offers support, programming, guidance and more for children in Arizona’s foster care system, particularly those living in group congregate care. Sunshine Angels also is a nonprofit organization that was founded to support foster children living in group homes within the Phoenix Metro area. Programs include Welcome Boxes, birthday celebrations, summer camp, scholarships, and more. VALLEYLIFE provides services to individuals with developmental and/or physical disabilities and their families through therapy, day programs, vocational programs, and group home care. Various departments in the Washington Elementary School District (WESD) also received checks (see this month’s School News section for more details). The North Phoenix Kiwanis Club also has other philanthropic programs, many of which take place during the holidays, including a Turkey Trot, Holiday Food Boxes, and a Christmas party for about 140 kids in WESD. It also purchases and donates student dictionaries to approximately 3,000 WESD third-graders each year. For more information, visit http://www.north-phoenix-az.kiwanisone.org.